Britain should take some Guantanamo Bay inmates if it helps the US close the Cuban detention camp, former attorney general Lord Goldsmith has said. Lord Goldsmith, who negotiated over the release of Britons at the camp, said he understood concerns over the proposal. But the existence of the camp had damaged the West and "it is in our interest to see this closed as soon as possible," he said. US president-elect Barack Obama has said he wants to close the camp. 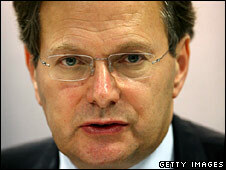 Lord Goldsmith stepped down in 2007 after six years as the chief legal adviser to Tony Blair's government. He told BBC Radio 4's Today programme the policy of detaining people suspected of links to terrorism without trial at Guantanamo had been "misguided". With less than 250 detainees remaining, he said they should be divided into those who should face trial and those who should be returned to their own countries. Those who could not be returned home for fear of persecution should be divided between the US and other countries, he said. Asked whether Britain should accept some detainees, he told the programme: "I don't know whether it's the case that we have been asked to do so and I don't know what the present government's attitude is. "But if it's necessary in order to close this camp, which has become a symbol of injustice, and it is part of an international scheme in which other countries play their part, then I think we ought to do so, yes." He said he recognised there were concerns about accepting potentially dangerous inmates, and arguments that the US should deal with the problem. But he added: "The fact remains this has damaged us too. It is damaging us at the moment because Guantanamo, instead of being a place which stops terrorism, has been a recruiting agent for terrorism." 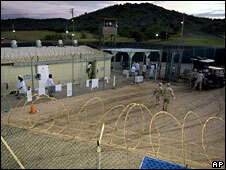 President-elect Obama has indicated that he wants the Guantanamo camp to be closed within two years. About 50 of the remaining inmates are thought to have been cleared for release. On Thursday the Foreign Office said: "We have made it clear that we think Guantanamo Bay should be closed. "We recognise the legal, technical and other difficulties and that the US will require assistance from allies and partners to make this happen." Portugal has offered to take some and Germany is considering doing so. The Conservatives have demanded the government clarify the situation by explaining how many inmates would be admitted to Britain and how they would be selected. The Liberal Democrats say Britain must "play its part" in helping close Guantanamo Bay but must be given reassurances by the US. Britain has taken back all British nationals and four inmates who were formerly British residents. The Foreign Office says it is still pressing for the release of another two former British residents. Lord Goldsmith told the programme he had been "unhappy" with the amount of time it took to get British nationals held in Guantanamo back to the UK. He said he would have resigned if they had not secured their return. "Whatever they may have done, they were British citizens entitled to our protection," he said. "If they had not been released, if they had not come back then I would have found my situation untenable and the prime minister knew that."